"The Town of Wakefield assumed operation of the Citizens' Gas and Light Company on August 4, 1894. At that time, there were 84 electric and 169 gas customers, 42 miles of electric wires and 600 poles in the town, but no street lights. The town was able to purchase the private company, its plant, land and manufacturing equipment after a vote at Town Meeting in 1893. This vote was the result of a law enacted by the Massachusetts Legislature in 1891 which allowed cities and towns to operate their own municipal light plants. At the time of the vote in 1893, a $180,000 bond issue was approved for the purchase and a Municipal Light Board, made up of three members, was established. State approval came soon after. In the early days of operation, the Wakefield Municipal Light Department did not operate electric current during the daylight hours. Only in the event of an emergency would the MLD start its generator during the day." -- Text from calendar by Jayne M. D'Onofrio. 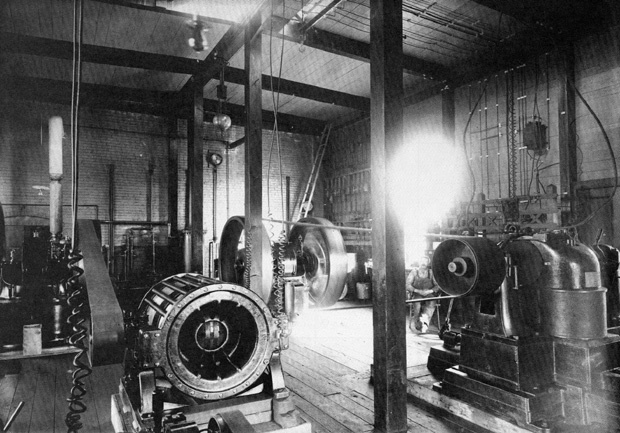 “Wakefield Light Plant, circa 1893,” NOBLE Digital Heritage, accessed April 22, 2019, https://digitalheritage.noblenet.org/noble/items/show/7143.